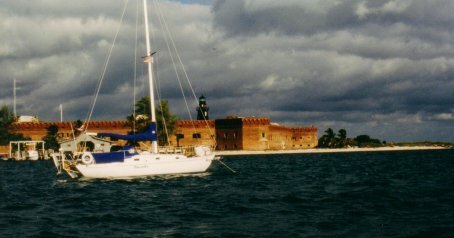 I had the best sail of my trip doing an overnight sail from Tampa, Florida to the Dry Tortugas (too far a hop to do in daylight). A perfect wind of about 15 knots on a reach blew the whole time. A big thrill was a large school of Dolphins raced to my boat around 2:00 am and because it was black dark and the phosphorescence in the Gulf is amazing - I saw these huge streaks of light in the ocean come tearing toward me. They played around the boat for about 15 minutes creating a great light show! Not having GPS, or Loran, my finding the Tortugas was pure dead reckoning and after such a long sail I was quite concerned I would find them. Right on schedule they showed up just slightly off my track so that was a thrill in itself. 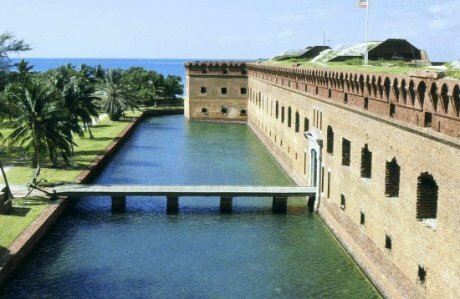 The Dry Tortugas are basically a few flat islands with the main one having this gigantic fort built on it all made of bricks. I was surprised to find I was alone there when I arrived in the morning. I explored the whole place and it was quite unique with the huge cannons (the largest ever made anywhere in the world) and immaculate buildings - so little rain there is no apparent damage at all. Later in the afternoon, a float plane flew in from Key West with some tourists. Next day I went on a snorkelling trip among some of the smaller keys. Next day, I sailed all the way to Key West arriving there in the middle of the night which made it more difficult than I expected to get anchored as it is pitch black dark with few lights. In the morning, to my considerable surprise, I found I was in the middle of dozens of power and sailboats all waiting for a big powerboat race in which Miami Vice's Don Johnson was taking part.